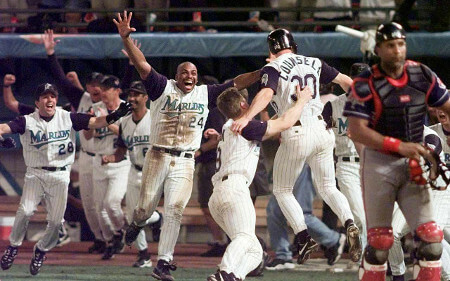 The 1997 World Series featured the Cleveland Indians, who were playing in their second World Series in three years. Their opponents were the Florida Marlins, who had set a record by reaching the Series in only their fifth season. The Marlins were underdogs, but they capped a stunning season by beating the Indians in seven games, becoming the first ever wild card team to win the Series. The final of Game 7 was decided in extra innings on an Edgar Rentería single. This is also the third and most recent time a Game 7 went into extra innings. 1924 and 1991 were the others, both times involving the Washington Senators/Minnesota Twins franchise.